Is there a Republican or Independent in Kentucky dumb enough to believe this? If you want to hold your nose and vote for McConnell to cause Harry Reid to become the Minority Leader, I understand. I won't be joining you. Just know what a spineless disingenuous jellyfish you are voting for. 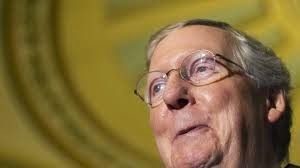 HENDERSON, Ky. — Mitch McConnell has a game plan to confront President Barack Obama with a stark choice next year: Accept bills reining in the administration’s policies or veto them and risk a government shutdown.